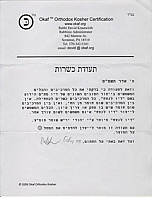 issued by the Chicago Rabbinical Council. 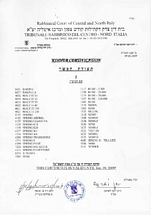 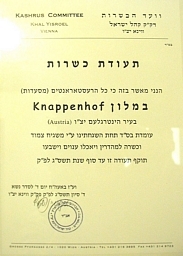 Authority: Rabbinate of the Jewish Community, Vienna, Austria. 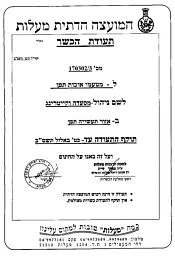 Authority: Isr. 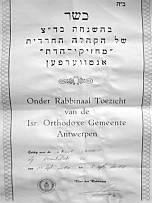 Orthodoxe Gemeente - Machzikei Hadas Antwerpen. 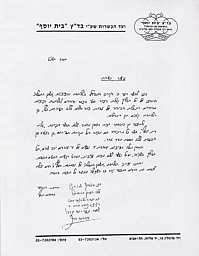 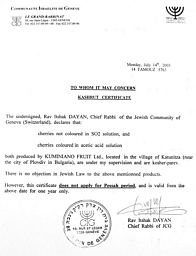 Authority: Rav Itshak Dayan, The Chief Rabbi, Jewish Community, Geneva, Switzerland. 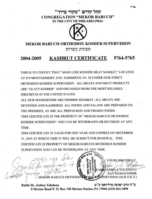 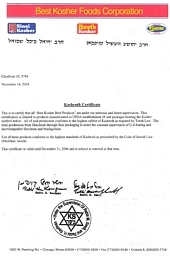 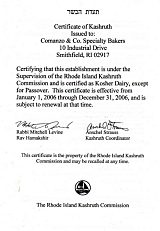 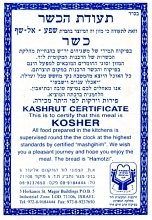 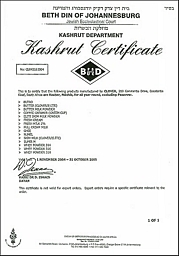 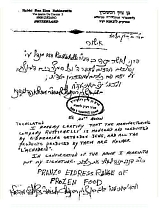 Authority: Lakewood Kashrus Organisation, New Jersey, U.S.A.
Authority: Rabbi Moshe Bensalmon, Kosher Toronto, Canada. 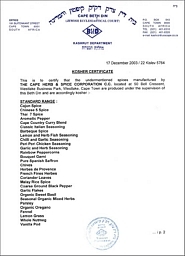 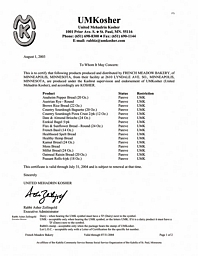 Licensee: Hubberts Industries, Brampton, Ontario, Canada. 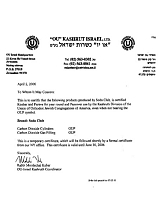 Licensee: Jelu-Werk, Josef Ehrler GmbH & Co KG (cellulose products for human consumption). 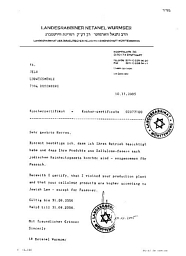 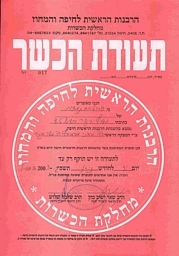 Authority: Rabbi Dov-Levy Barsilay, Hamburg, Germany. 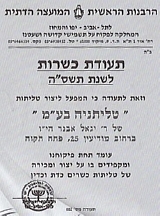 (Communaute Israélite Orthodoxe de Paris, France). 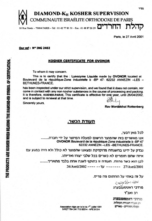 Licensee: Ovonor, Annezin les Bethunes, France. 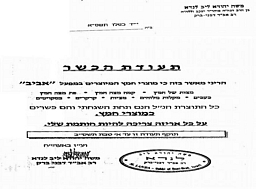 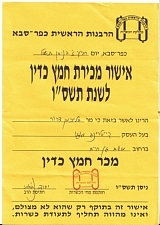 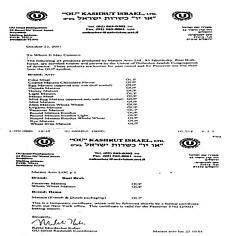 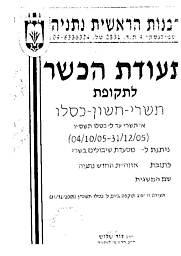 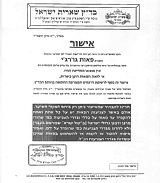 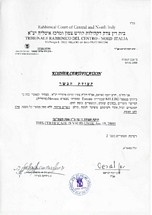 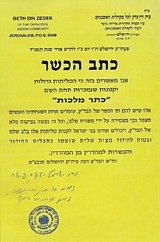 Authority: Badatz Sharit Yisrael, Bnei Brak, Israel. 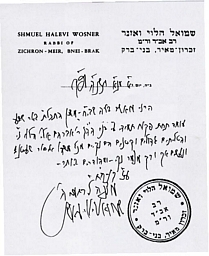 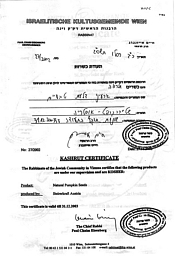 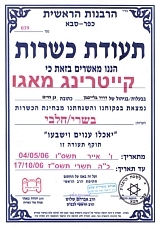 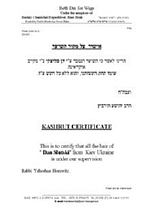 Authority: Rabbi Shmuel Halevi Wosner, Bnei Brak, Israel. 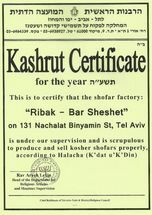 Licensee: Ribak - Bar Sheshet, Tel Aviv, Israel. 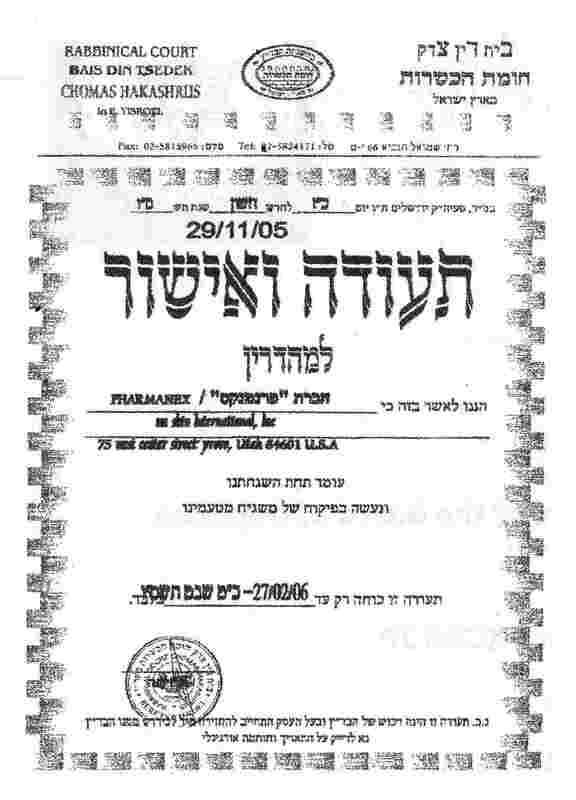 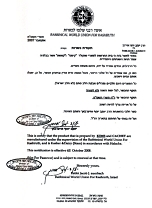 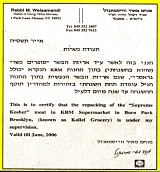 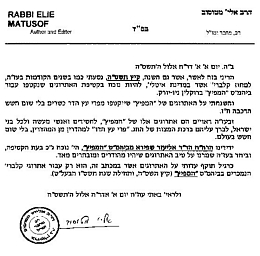 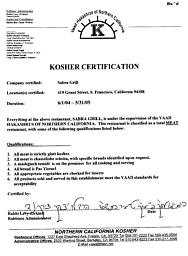 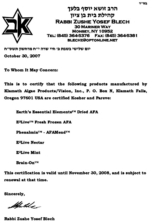 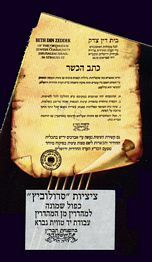 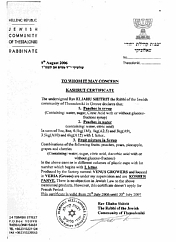 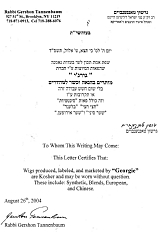 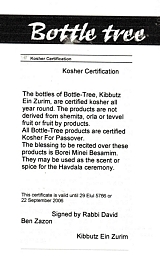 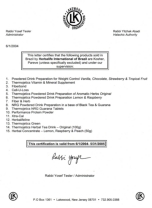 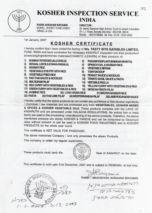 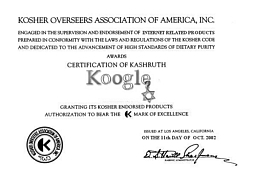 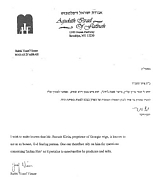 Authority: Rabbi Zushe Blech, Monsey NY, U.S.A.
Licensee: Klamath Algae Products / Vision Inc.
Authority: Rabbi Gershon Tannenbaum, New York, U.S.A.
Authority: Rabbi Yosef Viener, Agudas Israel, Flatbush NY, U.S.A.
Licensee: French Meadow Bakery, MN, U.S.A.
Licensee: Best's Kosher Foods Corp., U.S.A.
Licensee: Best's Kosher Foods Corp., Shofar, U.S.A.
Licensee: Sabra Grill, San Francisco, CA, U.S.A.
Licensee: Dr Lankin's Speciality Foods, U.S.A.
Authority: Rhode Island Kashrut Commission, RI, U.S.A.
Licensee: Comanzo & Co., Specialty Bakers, RI, U.S.A.
Authority: R' M. Weissmandl, Boro Park, Brooklyn NY, U.S.A.
Licensee: KRM Kollel Supermarket, Boro Park, Brooklyn NY, U.S.A.
Licensee: Aba Oil Company Ltd.
Authority: Mekor Baruch Orthodox Kosher Supervision, Merion Station, PA, U.S.A.
Authority: Rabbi Dovid Krautwirth, Okaf™ Orthodox Kosher Certification, Scranton PA, U.S.A.